Lock in a great price for Boutique Hotel Calatrava – rated 9.3 by recent guests! Extremely friendly and accommodating staff! Definitely a repeat on our return trip! Wonderful restaurant! Very clean accommodations! The staff was wonderful. The room was large, beautiful and comfortable. We loved our stay and the staff, especially Laura is worth mentioning: very upbeat, friendly and accommodating. Nice location. Well maintained and modern property! I have stayed at this hotel several times and am never disappointed. It is small and very personal and the staff are all extremely helpful and friendly. Breakfast on the roof is wonderful; the beds are incredibly comfortable; the rooms are spacious but the thing I love most is the peace and quiet despite the fact that all that Palma has to offer is just a stones throw away. It's a little oasis of calm. Perfect location, in the old town, at the edge of it, a few minutes walk to the 1st sandy beach south of Palma. Very convenient location. Very pleasant staff. Beautiful room, oversized, with great sunny terrace. Delicious chocolates gifts at night time. Very very comfortable giant bed, good Illy coffee machine, great SPA, etc. 5 Stars well deserved. This hotel was an absolute pleasure - first of all, w were upgraded to the Suite with a partial ocean view even though we only paid for standard. Our room was adjoining the terrace, which was lovely as we were able to walk 5 steps and enjoy the ocean view. The staff was extremely friendly and helpful. The restaurant in the hotel served some delicious food. It was such a good stay that we extended our stay in the hotel for an extra day ! Boutique Hotel Calatrava This rating is a reflection of how the property compares to the industry standard when it comes to price, facilities and services available. It's based on a self-evaluation by the property. Use this rating to help choose your stay! 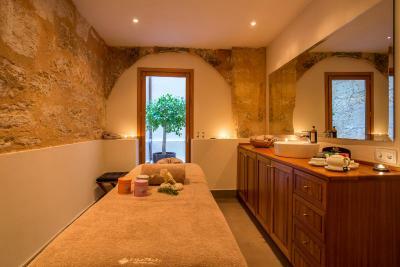 Located next to Palma’s Parque del Mar and the old city walls, Boutique Hotel Calatrava features a free spa and stylish rooms. Set in the old town, it serves breakfast on its terrace, offering views of the Mediterranean Sea. Each spacious room at Boutique Hotel Calatrava features chic, modern décor. All rooms have free Wi-Fi, a mini-bar, air conditioning, a Smart flat-screen TV and a private bathroom with bathrobes, slippers, free toiletries, a hairdryer with diffuser and a hairstraightener. 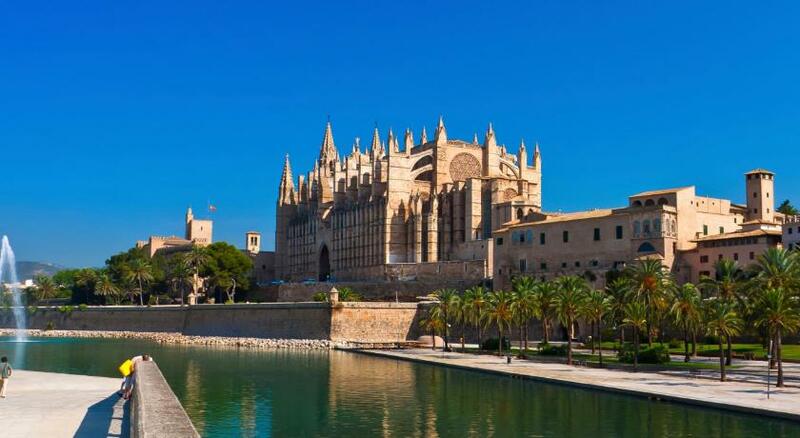 They offer lovely views of Palma's old town, the bay or Parque del Mar. Palma Cathedral and Almudaina Palace are within 1,150 feet of the Calatrava. Palma’s marina and seafront promenade can be reached in 15 minutes by foot. When would you like to stay at Boutique Hotel Calatrava? 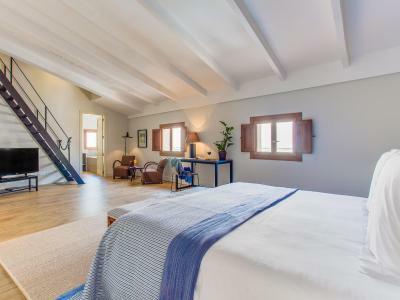 Offering views of Palma's old town from its balcony, these stylish rooms have modern design. They include free Wi-Fi, a mini-bar, air conditioning, a flat-screen TV and a private bathroom with bathrobes, slippers, free toiletries, a hairdryer with diffuser and a hairstraightener. There is free private access to the spa. Private parking is available at a location nearby (reservation is needed) and costs EUR 34 per day. Offering a private terrace with views over Parc de la Mar Park, these stylish suites have modern décor and traditional furnishings. They include a small seating area, free Wi-Fi, a mini-bar, air conditioning, a flat-screen TV and a private bathroom with bathrobes, slippers, free toiletries, a hairdryer with diffuser and a hairstraightener. Offering sea views from its terrace, this stylish suite has contemporary décor and a seating area. It includes free Wi-Fi, a mini-bar, air conditioning, a flat-screen TV and a private bathroom with bathrobes, slippers, free toiletries, a hairdryer with diffuser and a hairstraightener. This room includes the transfer from the airport to the hotel in a Mercedes Class E vehicle. The building is part of the marine façade of La Calatrava, integrated in a set of buildings aligned with the ancient Arabic wall, which no longer exists. The main entrance to the hotel is found in the Plaza Llorenç Villalonga. House Rules Boutique Hotel Calatrava takes special requests – add in the next step! Boutique Hotel Calatrava accepts these cards and reserves the right to temporarily hold an amount prior to arrival. Please inform Boutique Hotel Calatrava of your expected arrival time in advance. You can use the Special Requests box when booking, or contact the property directly using the contact details in your confirmation. The only minus was that it was possible to hear the footsteps from the floor above, and when I was staying in the hotel, there has been some "activity" (people walking above) almost each evening, around 11pm. This is excusable considering that it is located in an old building with wooden floors, so it is not something that is so easy to avoid, but still it was worth noticing, especially if it was the staff walking... Apart from that, I was extremely satisfied with everything. Parking was tough. Try not to bring a car. Rachel at teh front office was so nice! Restaurant didn’t have as much variety as we’d have liked (although food was lovely) and was expensive for what it is. I’d recommend eating out for better ambiance. Really beautiful boutique hotel. You wouldn’t be disappointed if looking for something stylish and romantic. Beautiful rooms and balconies, with gorgeous finishing touches and very comfortable. Jacuzzi and hot beds were fab. Room was too hot even in December, so had to open a window which was then noisy due to the road. They did not put our bicycles into a secure place until sometime around midnight. They just left them outside. Lucky it was a safe part of town. We could hear noise from the room above ours. Nice comfy big bed. Nice room and decor. Helpful staff. Nice breakfast on rooftop with view. Beautiful part of the old town next to the cathedral. The customer service of the staff was above and beyond. Nothing but I never had the chance to use the spa, pity. Everything, lovely helpful staff, good food, great restaurant recommendations, bar drinks good value. Room very relaxing after some sightseeing, with fantastic views of the harbour and coastline, lovely bed. A perfect setting to celebrate a special birthday. The staff went above and beyond to make us feel comfortable. Breakfast in bed on birthday morning with all that little extra. The spa for private use was pure luxury. Nice location, nicely decorated. The outside terrace was a little disappointing but it didn’t spoil our stay .. just didn’t seem quite as fitting for the rest of the hotel . Wonderful staff . Wonderful bedroom and spa ..